YOU NEED TO ADVICE US AT LEAST 48 HOURS IN ADVANCE IF YOU WANT TO CANCEL. DURING HIGH SEASSON CANCEL ONLY A WEEK AHEAD. We help backpackers stay on a budget with our low rates and free breakfast, drinking water, towels, linens, afternoon or evening snack, free use of two computers with internet, and Wi-Fi. Bikes, tours, cooking and language classes are available for a fee. Close to Zocalo, (which is the main plaza), cafes, markets, churches, parks and museums. Located in the historic center of the city on a quiet street, away from annoying loud traffic noises. You can relax in our flower and tree filled outdoor patio while visiting with our other guests from around the world. You can also enjoy watching television or a DVD from our collection, or play board games and cards in our living room. 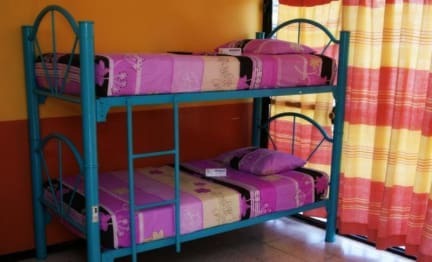 Hostal Pochon is a friendly, relaxed atmosphere where one of the most pleasant activities of your stay with us will be enjoying the other people that you will meet while here. When you are ready to go to bed, you can enjoy a restful sleep on an orthopedic mattress in one of our private rooms or in one of our dorm rooms with as few as four beds per room. All rooms have a fan to keep you comfortable while you sleep. Our guest kitchen, which includes a microwave and refrigerator, is supplied with everything you need to cook your own meals to help you save on your expenses. To purchase groceries, the market is conveniently located within a block of the hostel. There is also a BBQ on the patio for our guests to use. For those who want to experience Mexican nightlife, we are an easy walking distance to clubs and bars. Our friendly, helpful staff is here 24 hours a day to help you with your questions and needs. We want to make your stay at Hostal Pochon one that will make you look forward to returning to stay with us on a future visit. for 2007 and 2008 on hostelworld. Mexican Style Eggs, Omelets with Ham, Cheese or Mushrooms, French Crepes, Fresh Fruits, Home Made Bread with Butter, Jam and Honey, Mexican Beans, Coffee and Tea. The menu varies daily. Book in advance for one of our amazing cooking classes so that you don't miss out! The classes are very popular with both our male and female guests and with other travelers staying in Oaxaca. Our teacher starts you out from the first step of cooking by taking you to the market to teach you how to select your ingredients for your meal. She teaches you how to cook and prepare a full delicious meal on your own. You will learn how to make your own tortillas and salsa from scratch. You will even make an authentic Mexican beverage to go with the meal. The best part is eating what you have prepared! You will have made enough to share with your friends. Everyone who takes this class loves it, and are very excited about what they have learned. Contact us for prices or more information. We have just purchased brand new high quality Giant brand Mountain Bikes for your enjoyment. They will satisfy the serious bicyclist who likes to ride only good quality bicycles, as well as the casual bicyclist. There is so much to see and explore by bicycle in Oaxaca and the surrounding area. Plan a bike ride to explore the ruins in the mountains, discover beautiful scenery and places that you wouldn't be able to see otherwise, or enjoy a day seeing the many things there are to explore in Oaxaca. You can see so much more in less time on a bicycle. Get the most out of your visit in Oaxaca! Contact us regarding prices and scheduling a rental for you. We can book any tour for you that you are interested in taking. We have tour information available to you at the front desk and we are happy to give you information and assist you with the wide selection of tours that are available. We will take care of everything for you. All you have to do is enjoy your tour! You can contact us with any questions that you may have. 1. Junior suite- One bedroom with a king size bed, and a private bathroom. The living room has a private balcony overlooking the city to the Cathedral. Television and Wi-Fi is also in the room. The Junior Suite is like a hotel room at hostel prices! 2. Double bed with balcony - Cable television, one double bed, Wi-Fi, shared bathroom, . 3. Double bed - Wi-Fi, shared bathroom and one double bed. 4. Twin room - Two twin beds that can be turned into one King Size bed if desired. Small balcony, shared bathroom, and Wi-Fi. All have WI-Fi and a personal locker for each guest. We have all female dorms, all male dorms and a mixed dorm. We are flexible in trying to meet the needs of our guests, and we will try to accommodate the special needs or requests that we receive. Check in time is 1300, (1:00pm). Check out time is 1100, (11:00am). *To cancel or change your reservation, please email us at least 2 days before your day of arrival. Me encantó el hostal, los cuartos privados están súper bonitos. Está a 3 minutos caminando de la zona principal de Oaxaca. La host que nos recibió Manuela súper amable. Excelente ubicación y cordialidad de los anfitriones. Awesome hostel within walking distance to Oaxaca historical centre! Helpful staff, good breakfast, but bathrooms were tiny and not very clean. Mi experiencia durante mi estancia es que es un hostal gris, no hay mucha atención, entras y sales sin mayor problema, falla el internet y tienen problemas con el agua. Por lo demás esta bien, desayuno bien y buena ubicación. Saludos.